Fourth Row Center: Film Writings by Jason Bailey: New on Blu: "Ray"
So exactly how much bearing does the skill of the performances have on the overall quality of the movie? Should we give a subpar picture a pass because the acting is of such high caliber? Or should we judge it an even bigger failure, for squandering such fine performances at the service of a half-hearted, underdeveloped vehicle? 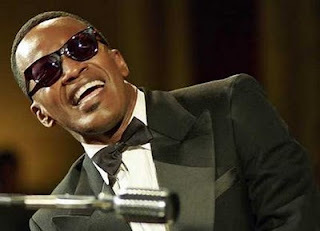 These are the questions posed by Taylor Hackford’s Ray, the 2004 biopic of R&B legend Ray Charles, for which Jamie Foxx won the Academy Award for Best Actor. That recognition, and the countless accolades that preceded it that awards season, was richly deserved—it’s a tremendous, accomplished performance, one that surpasses imitation and becomes an embodiment, a reincarnation, a riveting piece of acting and musical skill. The trouble is, the film surrounding this performance is nowhere near as loose, funky, powerful, or dangerous as Foxx’s show-stopping turn. Ray is entirely competent, and that’s the problem: It is simply too solemn and workmanlike in its strict adherence to the conventions of the Hollywood biopic, especially considering that it is the profile of a groundbreaker. James L. White’s screenplay is a pile-up of short, mostly shallow scenes; every line is pure exposition, laughably free of context. “No one’s ever combined R&B and gospel before!” Ahmet Ertegun (Curtis Armstrong) declares to a room full of people, who all know this information. “‘I’ve Got a Woman’ is a smash!” The narrative, which runs from forties to the sixties (with flashbacks to Charles’s childhood, and an epilogue in 1979), is maddeningly conventional, all compressed storytelling and music montages. It gallops through the high points at a breakneck pace, even within its leisurely 153-minute running time; it’s almost frantic in its attempts to smash everything in. Example: we have a studio scene where Ray’s sound finally comes together, followed by a ten-second intro to Jerry Wexler (Richard Schiff), then the song plays back as the record plays on a turntable, then he’s suddenly in a radio interview for the song, and the phone rings in the studio, and hey! It’s Ray’s future wife! And then he’s on a date with her, and then they’re immediately in love, and so on and so on and so on. It’s all too tight, too easy, and too, too predictable. Meantime, Hackford pushes in more gaudy musical montages, filling the screen with beauty shots, newspaper headlines, venue marquees, and welcome banners; maybe he’s trying to work old school, but this style of filmmaking was old hat in the ‘40s musicals Hackford stole them from. The big psychological payoff of the third act is rushed and trite, and the last ten minutes is done in such a rush that it genuinely feels like they just ran out of time, a feeling not assuaged by the “over the next 40 years…” title card and the tacked-on epilogue. But the film is beautifully designed—the costumes, cars, and interiors are all just right (with the possible exception of the nightclubs, which all look the same in the first half)—and impeccably acted. One can’t say enough about the sheer brilliance of Foxx’s work; he has the guy down to a tee, and his musical performances (Foxx is a trained classical pianist) are absolutely convincing. But there are several other actors of note—Terrence Howard’s oily sleaze is welcome, as are Robert Wisdom and Wendell Pierce (both from The Wire), while Schiff and Armstrong are a great two-act as the Atlantic ownership. Regina King is absolutely fierce as the “other woman,” back-up singer Margie Hendricks, and while Kerry Washington’s accent isn’t entirely convincing (at least early on) her wonderfully expressive face says more than any of her boilerplate lines. Much like the man himself, they can’t get the personal stuff right, but they sure do right by the music. The studio scenes are rollicking, and the picture roars to life in the thrilling sequence in which “What’d I Say” is improvised live on stage—it’s an electrifying scene (one that ends, of course, just as it gets going). These scenes manage to capture the exhilarating kick of music happening, of music history being made, of a genius at work. They are about creativity, and next to them, Ray’s scenes of tired theatrics don’t stand a chance. It’s hard to say why Ray plays so badly a mere six or so years after its initial release—perhaps it is the memory of the superior Walk the Line, which covered similar ground the following year, or maybe the spot-on parody of Walk Hard not long after. The film is still worth seeing, for the virtuosity of Foxx’s work and the energy of the music scenes. But much of it plays at the level of a TV movie—and a mediocre one at that. "Ray" hit Blu-ray on February 1. For full A/V and bonus feature details, read this review on DVD Talk. Gaudy's use of commercial pop up marquees for sale in those musical montages is indeed amazing. Great job!